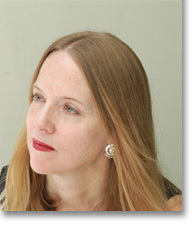 Sarah Arvio�s Sono with Visits from the Seventh (Bloodaxe), a combined edition of her two books, including an audio CD of Sono, appears in May. She has won the Rome Prize of the American Academy of Arts and Letters and a Guggenheim Foundation fellowship, among other honors. For many years a translator for the United Nations in New York and Switzerland, she now also teaches poetry at Princeton. Three poems from "Sono: cantos"